Go all out for your 30th birthday this year and have a party that you will never forget. 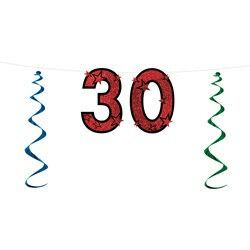 Start your decorating by hanging up this 30th Glittered Streamer. The streamer is seven (7) feet long and the 30th is over two feet tall! Once your guests enter the party, they will see this 30th Glittered Streamer and be impressed with how much effort you put into this party. Pair this with the 30th Gleam N Burst Centerpiece and your decorating will be one step closer to perfect. There is no reason to be ashamed of growing older because there is no way to stay in your mid-twenties, so you might as well celebrate while you can!